The early 1930s could not have been worse for shipping. With the coming of the Depression, the North Atlantic had grown very short of its most precious commodity: passengers. Ships began to sail half-full, and sometimes even emptier, and future prospects were bleak. Both Cunard and its nearest rival, the White Star Line, were hard hit, with too many ships against far too few occupied passenger berths. Called upon to assist, the British government authorised a loan of GBP9.5 million, on condition that Cunard and White Star merge. Cunard-White Star Line formed on 1 January 1934 and lasted until 1949. Cunard's fifteen liners were joined by a further ten from White Star and these twenty-five ships included such legendary names as the Mauretania, Aquitania, Olympic, Majestic, Queen Mary and Queen Elizabeth. 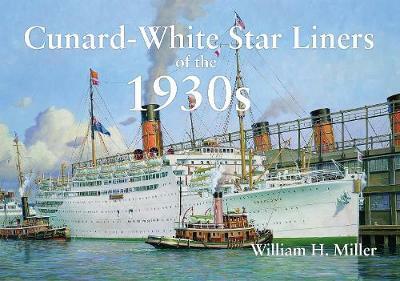 In this book, William H. Miller offers a nostalgic review of the ships of the Cunard-White Star Line in Cunard's 175th anniversary year.